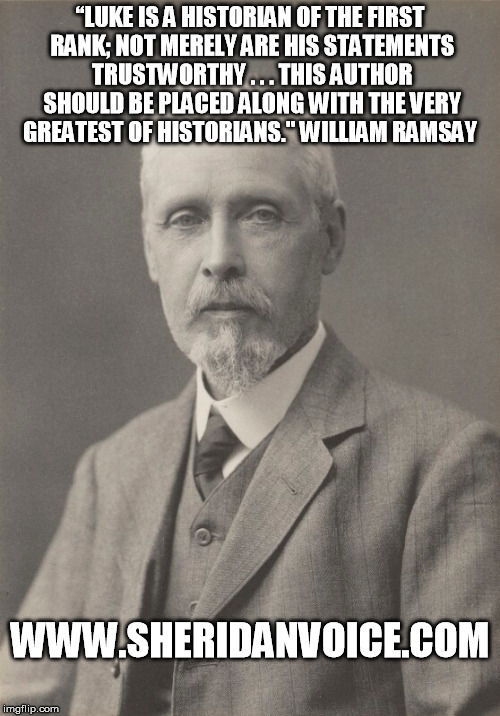 William Ramsay (1851-1939) was a Scottish archeologist. In his day scholars had trouble proving specific things about the Asia Minor of Biblical times. For instance, nobody really knew anything about the locations, histories, and politics of many of the cities mentioned in “The Acts of the Apostles.” Luke’s narrative was the only record available. It became “cool” to be skeptical about Biblical matters in Ramsay’s day, and he was one of those “cool kids.” Ramsay wanted to prove that Luke was inaccurate, and he believed the only thing needed to fulfill his task was some independent research. So Ramsay put Luke to the test spending many years digging up the ancient cities and documents of Asia Minor. Ramsay, holding the writings of Luke in one hand and the skeptic’s archeological spade in the other, compared the findings of the latter with the claims of the former – very carefully. What did Dr. Skeptical conclude after years of testing Luke? Ramsay went on to research Luke’s friend’s writings too, Paul. This time he was less skeptical. The critics of the day believed most of Paul’s letters were forgeries. What was the result of Ramsay’s investigation of Paul? The critics need to be criticized, Luke and Paul are accurate! Reason and research aren’t contrary to faith. Many skeptics became skeptical because Christians of the day became too mystical combining the Bible with fairy tales – is it any wonder people become skeptical? Even great reformers would dismiss the findings of Science because of a warped view of Biblical texts. But the Scriptures bear the test of Scrutiny, Science, Common Sense, and Daily Life. The Bible is a natural companion for normal living and its truths transcend borders. The Bible isn’t a book for Disney Fairy Tale Lands. Kudos Mr. Ramsay for your honest investigation.